Off the style point a little bit but just had to share with you about Beauty Boxes as the two I subscribed to arrived today! 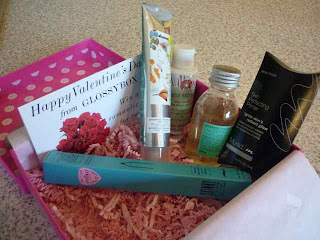 In case you haven't heard about Beauty Boxes, they are box of beauty goodies sent out once a month. You don't know what you're going to get in each box and sizes of the products vary from full size to samples. They cost from £5 to £12 per month on a subscription that can be cancelled at any time. So, in the interests of research (of course), I ordered the Feel Unique and the Glossy Box beauty boxes a couple of weeks ago and here's what arrived! So I'm looking forward to testing these products over the next few weeks! If you're a product junkie like me, you'll love these. Other boxes available from (amongst others) Carmine (first box on offer for £5 atm) and Amarya (natural/organic products). Thought I would treat myself to a GlossyBox and got the Harrod's special edition........and in it is my new favourite lipstick - Burberry Rosewood.......happy girl tonight!